Veal and gout is the 92nd top topic in the Gout and You series. My gout foods table for meat uses nutritional data for the USDA key foods. Veal is not included in the key foods list, but I’ve added it to my table because of it’s popularity with gout sufferers. Nutritionally, it is as unremarkable as meat gets. As you can see from the gout foods table for meat, it enjoys an average position. Do not be misled though, those Index numbers are just a guide to help you balance your meals. You need a mixture of positive and negative index numbers to provide the variety that is vital to a healthy diet. Veal is becoming popular in America, but has been a significant part of European diet for centuries. It is quite low in fat, so if cooking with dry heat (roasting, grilling or frying), veal benefits from a light brushing of olive oil. Most European recipes use braising or stewing. When serving veal, as with all meat, you should balance the meal with a similar quantity of whole grains and twice as much vegetables. Many veal recipes can be improved by adjusting the quantities of meat downwards and the quantities of vegetables upwards. You can also serve additional vegetables as accompaniments. That way it is quite easy to eat healthily, whilst still enjoying the flavor of your favorite foods. 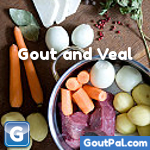 If you have good veal recipes that can help fellow sufferers choose better gout foods, please share them in the gout support forum. 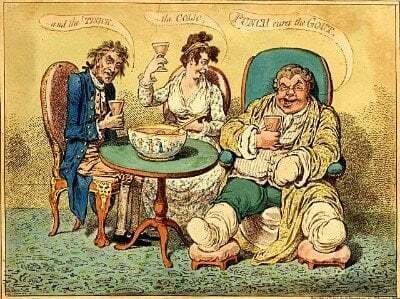 Tomorrow, #91 continues top 100 gout searches countdown with another gout foods topic. Please subscribe to the free gout update service to make sure you don’t miss it.